Fine wine has shown strong actual performance over recent years. 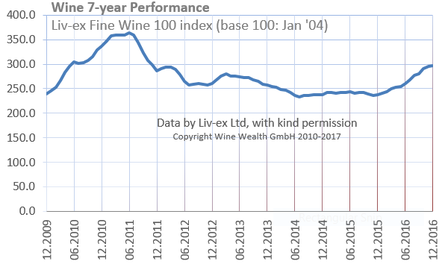 The broadly accepted benchmark for investment grade wine is the Liv-ex Fine Wine 100 Index, calculated by Liv-ex Limited, the electronic marketplace provider. Global uncertainty affects wine, too. But not as much: it has consistently shown more resilience and less fluctuations than other asset classes, and a more lasting return to long-term performance. This was proven in the recent past (see below chart) and has been a durable and reassuring pattern over the last forty years.